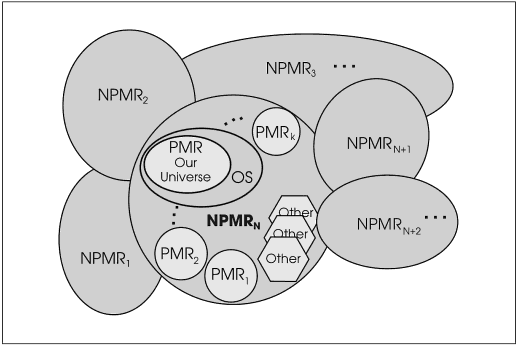 Nonphysical-Matter Reality is defined to be everything other than PMR. It is the non-material (from the view of PMR) superset of PMR that contains its own unique properties, materials, and laws. Like PMR, NPMR can also be effectively and purposefully manipulated (is operationally viable) and is inhabited by beings that are sentient in it. These subsets are enumerated as one of the various NPMRn. For convenience, the NPMR subset that contains our PMR has been named to be NPMRN. Like PMR, the various NPMRn are also simulated VR's that are computed in their own calculation space (dimension). This page was last modified on 20 November 2017, at 07:00.